We offer centrifugal ultrafiltration devices with two molecular weight cut-off options: MWCO=10 kD (10K) and MWCO=3 kD (3K). The ultrafiltration membrane allows molecules with molecular weight smaller than the cut-off to pass through into the filtrate collection tube, while molecules larger than the cut-off retained on top of the membrane. 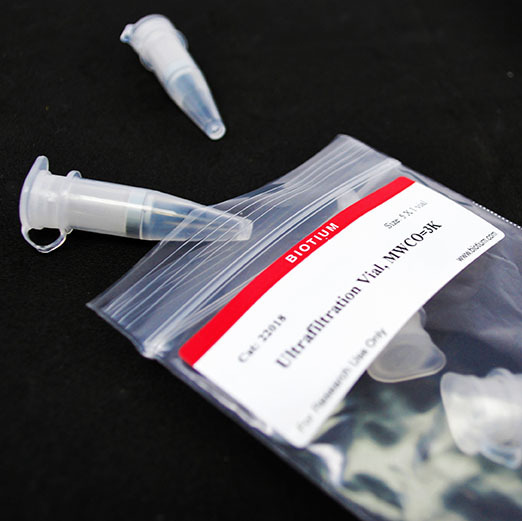 Ultrafiltration can be used to rapidly and easily remove small molecules such as Tris, glycerol and glycine from antibody solutions, or to concentrate antibodies prior to conjugation. They also can be used to remove free dye or free biotin from antibodies after conjugation. 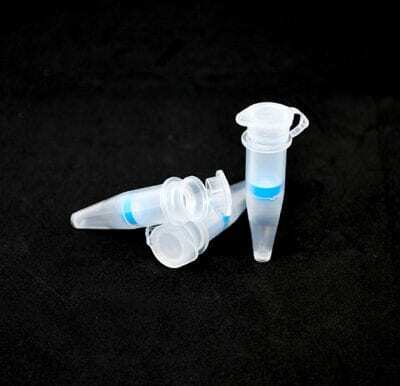 For ultrafiltration of proteins, it is recommended to use a MWCO 3- to 6-times smaller than the protein to be retained. Ultrafiltration vials with MWCO=10K are recommended for ultrafiltration of antibodies and other proteins larger than 30 kDa. Vials with MWCO=3K are recommended for ultrafiltration of proteins larger than 10 kDa. Ultrafiltration is not effective for fractionating proteins (separating one protein from another protein based on size) unless there is at least a 10-fold difference in the protein molecular weights.